Instagram is a social networking application. This app made for sharing videos & photos. This app only runs on a smartphone. Like Twitter & Facebook, everybody who creates an account on Facebook or Twitter. They have their profile & news feed on that social web site. When you post a video or photo on your Instagram account, it will be shown on your timeline or profile. Other peoples who use Instagram & follow you, they will see your posted photos & videos on their timeline. Like same, you will also see the post on your timeline of other peoples you choose to follows. Instagram is available on Android, Windows, & iOS devices for free. You can also access Instagram on your computer by using the web, but you can't upload & share your videos & photos on the computer. If you have to upload videos or photos, then you have to use a smartphone. You can only upload & share your photos on Instagram by smartphone. Instagram is getting popular day by day. Recently Instagram passed 150 million active users. If you have to post photos on Instagram, then you have to look good in pictures. If you are not a photographer, then you may get some problems to post your photos in right conditions. So, you have to edit your photos or videos very carefully. For editing, you need some editing apps. So, here is the list of some good editing apps. Following apps are available for Android & iOS also. This app is a combination of vintage & stylised filters, with the variety of conventional image editing tools, from cropping to spot removal, colour correction & drawing. This app is available for iOS & Android devices. This application is free for all. But if you want additional effects, then you have to buy this pack for 0.99$. 1] You will get Contrast, warmth, brightness & sharpness controls. 3] Drawing & basic text. 5] You can import from photo gallery. 6] You can share to any Android app. The application starts with a carousel of photos to import. It takes a time to browse. It is a slow way process. After clicking the gallery button, it will work better. It will get access to your folders on your device. At the bottom of your mobile screen, there are some different functions available. It depends on your mobile's screen size. They will divide beyond 2 or more pages, so swipe right & left to see the fill set of functions. It's easy to use various processes, one after the other, but each process uses destructively so you can't go back & reset the settings. If you decide against an effect, you will have only one option. You have to start from beginning because there is no undo history in iOS & Android apps. Use your Android mobiles back button to come back to the main menu without affecting an effect. If you have to start, then start from Crop & Orientation tools. Because these tools are useful to start. The crop is remarkably fully implemented, with the capability to lock to different aspect ratios, & to flip within portrait & landscape shapes. Moving a corner changes the crop size, & we especially like how it extends & decreases nearby the centre of the crop region rather than the far corner. You can apply filters to any photo because it is very easy, but that doesn't mean you should not use various editing tools to get accurately the look you want. In this application, the first tab on the bottom editing bar is for editing your photo. This app has standard tools. There is also an option of Exposure, Brightness, Contrast & others. It also gives you the option to edit the mid tones, highlight tones & shadows tones. Every option has three colours attached, red, blue & green. You can manage the colours. How much you want to highlight your photo is all depends on you. This app is an excellent app. You must try this app. This application is an excellent app for editing photos. It's easy to use. Many people's uses this app for editing photos. This app is available for iPad & iPhone. This app is free. There are two points to remain in memory when handling Snapseed application. If you ever think missed or forget what the symbols mean, you can touch the question mark symbol to represent an overlap with help advice. The other thing to remember is each tool in Snapseed has several sliders that you can enter by swiping up & down on your picture. Ever wish you could get those beautiful night sky images with your camera, but thought it was not possible without a pro grade DSLR with a standard shutter? The Slow Camera Shutter Plus PRO app enables your smartphone to display large images so you can catch crackers, shooting stars, & neon signs without all the blurriness & hard glares. This app is one of the best app in photo editing apps. 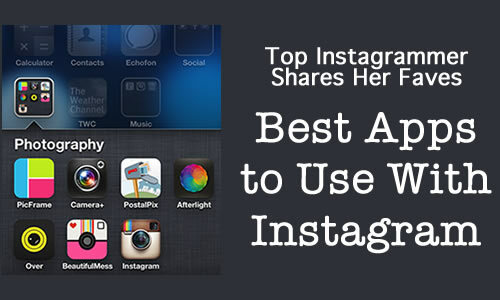 It is excellent for editing pics that you can post on your Instagram account. It makes the pics look great. It helps you with new and more creative picture editing. It gives you great photo effects. Especially for Instagram, this app is superb. The impact creates the look of a miniature planet, which is opposite of the tube result. These images can take with specific & productive fisheye lenses, but it is much simpler to construct one from a 360 degree panorama by using Photoshop. However, customizing the area of the sphere & where the focal spot should be could get some time, so why not just let your smart phone do most of the work for you? Apply Instant PicFrame to frame your photos and post to Instagram! Instant PicFrame helps you combine multiple photos into amazing looking shells or frames, or collage & share them with the world via Instagram, Facebook, Email, Twitter. With 100 fully adaptable frames, rounded corners, photo effects, shadows, lots of patterns & a simple color picker you will forever have a different & distinctive look. Cross processing is a method that forms for processing film images. By processing the film in the wrong type of chemicals e.g. preparing film in slide chemicals, you could produce a highly stylized image with drastically different colors & contrast. However, cross processing film is a mostly hit and miss thing which is tough to judge & needs a plenty of experimentation to obtain the wanted impact. Nowadays we can assume cross processing digitally in applications such as Photoshop, or any other which involves a Curves function. Digital cross processing has the added advantage that we can quickly squeeze the results until we get the result we want. 1] I selected the video filter. 2] I selected the video quality. 3] I selected the music. 4] I selected the video playback speed. Ultimately, I either shot a new video or selected one that previously stored on my phone.Once all the parameters were selected, the rendering of the “old timey” video took only a few minutes. Then I could perform it back, save it to iOS device or share it on Facebook, Twitter, & YouTube. Right now, the developer is running a competition for the best video. Here is a video example of how to do. On most days, in maximum conditions, the camcorder on your smartphone is a solvent in search of a difficulty. The capacity to shoot clips with your mobile device is its Catch 22. The beats of daily life do not usually deserve filming. And when that exceptional moment advantages capture something cute or absurd or, as occurs with kids, both the camcorder application causes its trap. Wonder, it's an excellent camera! Even the highest resolution models jam advanced imaging chips backward crummy spots of glass, with size constraints requiring tiny sensors and worse optics than last decade's throwaway pharmacy point-and-shoots. So at best, those occasional, standout memories are successfully recorded for posterity, but as muddy, silly smears. With the best choice of apps, though, something extraordinary happens. An unnecessary clip of a bridge rolling history, or of flows falling, or of a kid doing anything at all, becomes immediately, irresistibly poignant. The poor quality of the hardware becomes an asset, a digital rewrite of that missing age of analog simplicity. The mystery to great smartphone video is to drown it in managed nostalgia. A world of universal camera based camcorders is not a beautiful place, but a planet is overflowing with pocket size, simulated 8mm film cameras is filled with surprising poetry. The video is beautiful but terrible. Photos are simple but annoying. Everlapse is thing new in between. Created by the former CoTweet team, Everlapse originates today so you can edit photos into digital flipbooks, let friends add their shots, & view the evolving work as a rapid fire slideshow. The free iOS app connects the optical communication of Snap chat with the stop motion of Vine. The interesting element is its flexibility. Join a few images of scenery or skyline from the same point to obtain a time lapse. Formulate a current status flipbook by requesting friends what they are reading, eating, or doing right now. Start with your book, meal, or activity and your followers will fill the slideshow with their prospects. Tell a tale with stop motion photography or a storyboard. Or just take a bunch of photos from a night out to create an album that moves on its own. Average Camera Pro is a well thought out application that will get you satisfying ends when you are in exciting low light conditions, like a darkened room or at midnight. The app can capture up to 128 images, then heaps & normalizes the effects. The stored photo has dramatically lowering noise. The app also lets you fix a display time for every picture, everywhere from 1 to 30 seconds per frame. It’s great for night cityscapes or capturing star trails. The app also lets you secure focus, exposure & white balance, & gets you fix how long the app waits back taking the first photo. Wait times can differ from moment to up to 90 seconds. The timed start will help settle out any vibrations so your clicking on the screen button will not harm your ultimate photo. Recreate the tilt shift impacts by utilizing your PC no tilt shift lens needed! Create beautiful dioramas by using computer generated tilt shift impact. Tilt Shift Dynamo supports you produce the form of a miniature scale model in post processing without limiting yourself to a particular angle at the time of the shooting & without spending in pricey tilt shift glass. Tilt Shift Dynamo provides convincing, natural looking tiny at a little fraction of the value of a real tilt shift lens. & the greatest part is it works just as good as or better than glass & metal tilt shift lenses. Turning the lens affects a macro shot or a little scene. This one effect is simple to reproduce in the post. You don’t miss anything by doing the tilt shift effect in post processing, and you won’t gain anything by using a real tilt shift lens to catch the same view. In fact, by utilizing a real tilt shift lens, you waste much of the service was given by advanced autofocus cameras, surrendering the AF & automatic gap control. Check out today’s tilt shift lenses: they lost an arm & a leg, yet they are all standard focus, & some of them still need you to set aperture manually & use stop down metering, reducing down your shooting a fabulous deal.